With the CV Surgery Risk app you can select a procedure and input various patient characteristics to quickly assess typical risks associated with cardiac surgery. 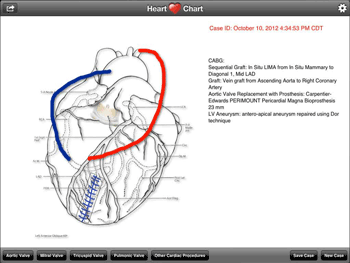 Heart Chart lets you quickly document your cases with images and text and share those cases. 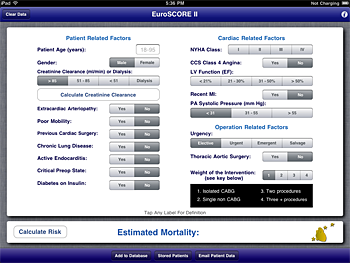 The EuroSCORE II calculator uses refined patient factors to quickly predict cardiac surgical risk. The Cardiothoracic Study Questions app allow you to assess your knowledge of Thoracic Surgery with questions, answers, photos, video, and other reference material from SESATS. Medical Information - On The Go! Knowledge is power, both for doctors and patients. And we need access to that knowledge at all times and in all places: at home, at work, in the hospital, on the subway. CVOffice provides mobile applications for medicine to make accessing information just a tap away on your iPhone, iPad, or iPod Touch. We believe this will make healthcare providers more knowledgeable, patients more informed, and medical care more understandable. Whether you are a physician or a patient, a developer or looking for a developer, please explore the website and don't hesitate to contact us.